The gases around the battery can explode if exposed to flames, sparks, or lit cigarettes. An explosion could result in injury or vehicle damage. Batteries contain sulfuric acid which can burn skin, eyes and clothing, if contacted. Do not attempt to push-start your automatic transmission vehicle. Automatic transmissions do not have push-start capability. Attempting to push-start a vehicle with an automatic transmission may cause transmission damage. When the battery is disconnected or a new battery is installed, the automatic transmission must relearn its shift strategy. As a result, the transmission may exhibit a combination of firm and soft shifts. This operation is considered normal and will not affect function or durability of the transmission. Over time, the adaptive learning process will fully update transmission operation. Use only a 12–volt supply to start your vehicle. Do not disconnect the battery of the disabled vehicle as this could damage the vehicle’s electrical system. 1. Park the booster vehicle close to the hood of the disabled vehicle making sure the two vehicles do not touch. Set the parking brake on both vehicles and stay clear of the engine cooling fan and other moving parts. 2. Check all battery terminals. Remove the positive terminal cover (if equipped) and any excessive corrosion before you attach the battery cables. Ensure that vent caps are tight and level. 3. Turn the heater fan on in both vehicles to protect from any electrical surges. Turn all other accessories off. Do not connect the end of the second cable to the negative (-) terminal of the battery to be jumped. A spark may cause an explosion of the gases that surround the battery. : Do not attach the negative (-) cable to fuel lines, engine rocker covers, the intake manifold or electrical components as grounding points. 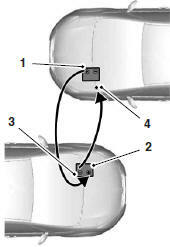 In the illustration, the vehicle on the bottom is used to designate the assisting (boosting) battery. 1. Connect the positive (+) jumper cable to the positive (+) terminal of the discharged battery. 2. Connect the other end of the positive (+) cable to the positive (+) terminal of the assisting battery. 3. Connect the negative (-) cable to the negative (-) terminal of the assisting battery. 4. Make the final connection of the negative (-) cable to an exposed metal part of the stalled vehicle’s engine, away from the battery and the carburetor or fuel injection system. Ensure that the cables are clear of fan blades, belts, moving parts of both engines, or any fuel delivery system parts. 1. Start the engine of the booster vehicle and run the engine at a moderately increased speed. 2. Start the engine of the disabled vehicle. 3. Once the disabled vehicle has been started, run both engines for an additional three minutes before disconnecting the jumper cables. 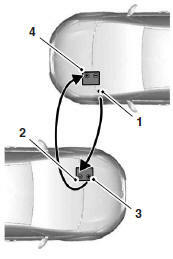 Note: In the illustration, the vehicle on the bottom is used to designate the assisting (boosting) battery. Remove the jumper cables in the reverse order that they were connected. 1. Remove the jumper cable from the ground metal surface. 2. Remove the jumper cable on the negative (-) terminal of the booster vehicle’s battery. 3. Remove the jumper cable from the positive (+) terminal of the booster vehicle’s battery. 4. Remove the jumper cable from the positive (+) terminal of the disabled vehicle’s battery. After the disabled vehicle has been started and the jumper cables removed, allow it to idle for several minutes so the engine computer can relearn its idle conditions.